I bought some peaches that turned out to be not as sweet as I expected. Isn’t that disappointing? What to do with all that fruit? Here is a wonderful solution. 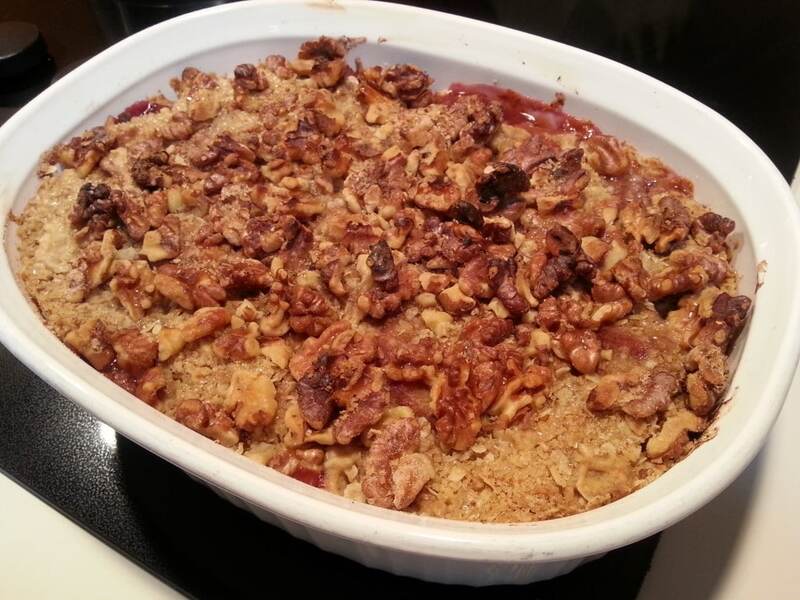 Bake a fruit and nut crumble dessert. It’s easy and now all the fruit you purchased won’t go to waste. Serve it warm with vanilla ice cream. 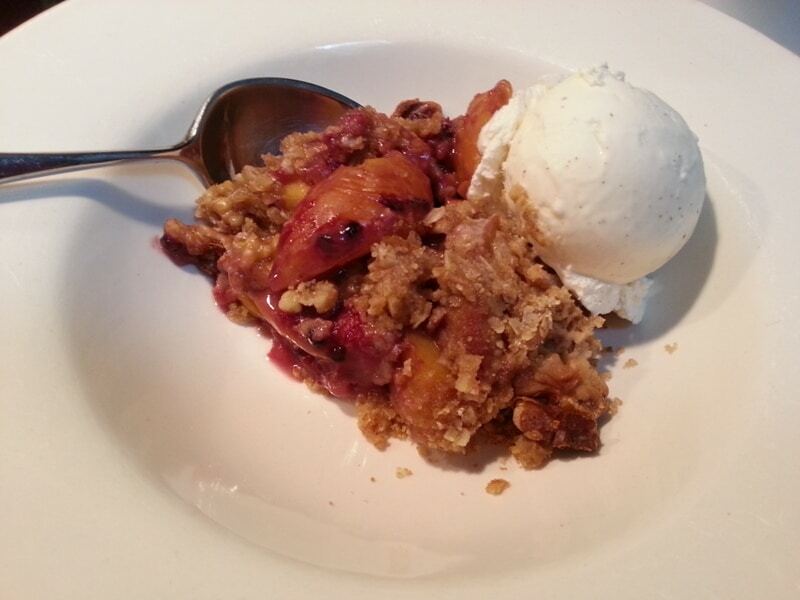 You can substitute the peaches and walnuts for plums and almonds if you’d like. Any fruit and nut combination will work. Here’s the printable recipe for you. Enjoy! 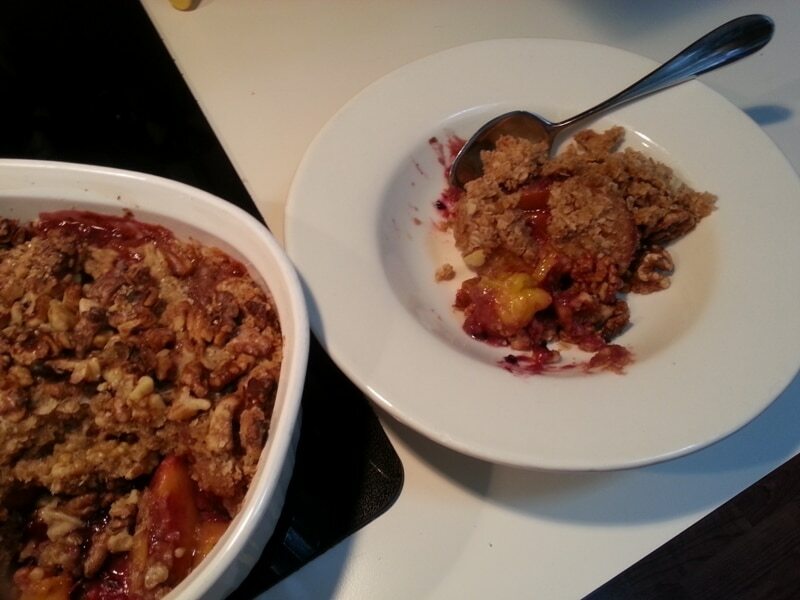 Kitoula's recipe for Peach and Berry Crumble with Walnuts adapted from Ina Garten's, Barefoot Contessa. For the fruit filling: In a large bowl, combine the sliced peaches, ⅓ cup of the granulated sugar, ¼ cup of the flour, and the orange juice. Add the berries and toss lightly. Pour into a 9 by 12 by 2-inch baking dish. For the crumble topping: Place the remaining 1 cup of flour, the remaining ⅓ cup of granulated sugar, the brown sugar, and the salt in the bowl of a food processor fitted with a steel blade. Add the butter and pulse until the butter is the size of peas. Work it with your hands until it's in large crumbles. Add ½ cup of chopped walnuts. Spread the topping evenly over the fruit, making sure the fruit is covered. Sprinkle with some extra walnuts and sugar. Bake for 40 minutes, or until the fruit is tender and bubbly and the topping is golden brown.